Fiji. Colombia. Bhutan. The Caribbean. Seville. Prague. Cambodia. What do these places have in common? Well, they’re amazing places to visit, of course. However, they also share another characteristic: they’re ranked below our beloved Crescent City on a list of places to visit in 2018. 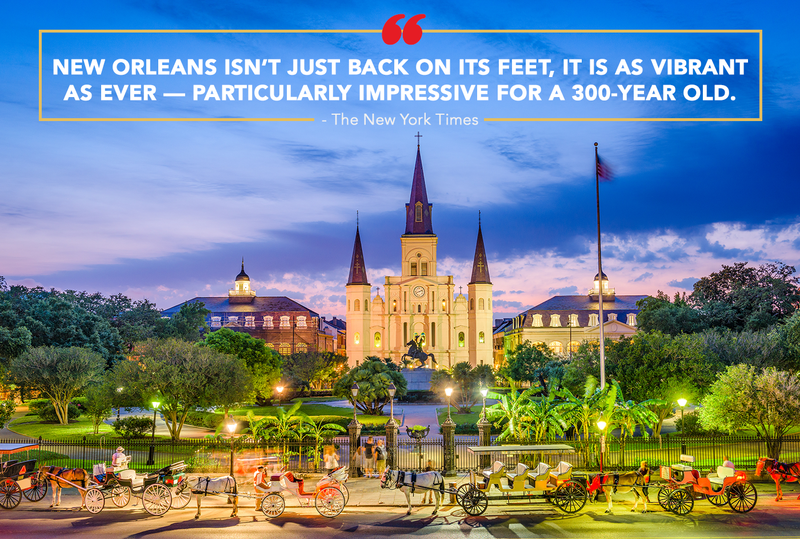 In fact, this list, compiled by the New York Times, ranks New Orleans as the NUMBER ONE travel destination this year. This isn’t news to us, but it never hurts to hear people say nice things about you, right? There is no city in the world like New Orleans. Influences from Europe, the Caribbean, Latin America, Africa and indigenous peoples have made it the ultimate melting pot. And that diversity expresses itself in a multitude of ways that define New Orleans in the American imagination: music, food, language, and on and on. Though it’s been a long recovery from Hurricane Katrina, New Orleans isn’t just back on its feet, it is as vibrant as ever — particularly impressive for a 300-year old. Impressive, indeed. The Times notes that there are many events that will commemorate this special year as we celebrate our 300th birthday. The article also highlights the upcoming $6 million Bourbon Street improvement, the opening of the Sazerac House (a visitor’s center and cocktail museum) and the robust expansion of the streetcar line. We can’t wait to celebrate you, New Orleans, and we’re always happy to see others celebrate our success as well! Click here to read the rest of the New York Times’ top travel destinations for 2018. Stronger than ever. Proud to call it home! We’re local. We’re global. As an affiliate of Leading Real Estate Companies of the World® and Luxury Portfolio International®, GARDNER REALTORS has connections to the very best real estate brokers who love New Orleans!